Baldovinetti, Alesso (Florentine, 1425–99). A delightful student of Fra Angelico who left few tracks, Baldovinetti is often associated with Uccello and Andrea del Castagno for his early Renaissance stylization and precise depictions of nature. Baldovinetti excelled in his landscapes (Bernard Berenson remarked on how his backgrounds seem to envelop their subjects in a 'poetry of space'). Baldovinetti would certainly be better known, but for some bad luck and bad ideas; much of what may have been his best work, as at Sant'Egidio in Rome and Santa Trinitá, was destroyed in later centuries, and some of his surviving frescoes are badly faded, due to his experimental technique of finishing them off a secco with an egg yolk based varnish. 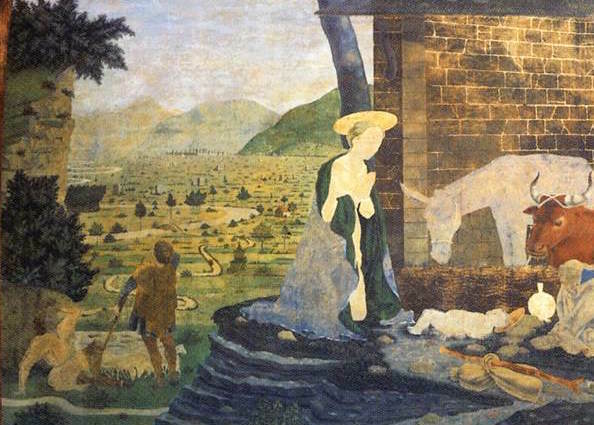 Rare for his day, Baldovinetti became interested in the art of mosaics, and he restored some of those in the Baptistry and San Miniato. Works at SS. Annunziata, Uffizi, S. Niccolò sopr’Arno, S. Miniato, Santa Trinitá.